For the most discriminating traveller who demands the best in travel accommodation. The best that Vista Cay has to offer. 3 bedroom-suites: King master with attached private bathroom. Queen bedroom also with private attached bathroom with wheelchair accessible shower room. 3rd bedroom has 2 Twin beds with attached bathroom as well. Each room has large new HD flat-panel TV. Wonderful top of the line mattresses and linens ensure a great night's sleep. Top notch furniture & furnishings throughout the home. Fully equipped kitchen: with all appliances and cookware. You only have to bring groceries ! High-speed WIFI throughout the home. Free North American telephone calls. There is no better home-away-from-home. Next to Convention Centre:walkable to convention centre without driving. 15 minutes to Disney, 15 minutes to Universal, 10 minutes to Sea World, minutes to all great shopping malls: there is no better location. Once you have stayed here, you will never stay in a hotel again ! Canadian owner dedicated to providing the best in travel accommodation. 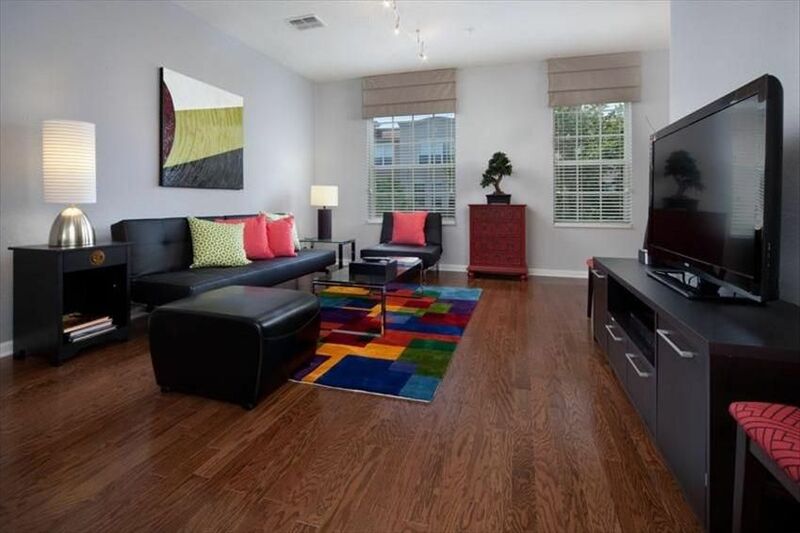 Most convenient location and the best layout in this townhome with 3 bedrooms and 3.5 bathrooms. Free Long Distance. Amenities: Wonderful Club House with double-Olympic sized Pool, spa, gym, games room, theatre, business centre, concierge. Close to Shingle Creek Golf Course. Tennis closeby. Rosen Hotel and Westin Hotel adjacent. Publix supermarket closeby. Other Activities: 10 minutes to Sea World and Wet'n'Wild. 15 minutes to Disney. 15 minutes to Universal/Harry Potter. 15 minutes to Premium Outlet Mall and many other shopping areas. Numerous great restaurants close by. Resort offers discount tickets to all major theme parks. Free high-speed WIFI throughout home. Free North American telephone calls. Large flat-screen TVs in everyhome. Recently awarded the 'RATED EXCELLENT' award. This exclusive award recognizes outstanding vacation rentals based on reviews from past guests. It distinguishes this property as one of the best vacation rental properties. Excellent. The home is beautiful. Mr. Samuel Lee, the owner is a very caring. We enjoyed a lot the property. When I had a question, Mr. Lee always was present. Thank you for staying in our home. We are so glad you had enjoyed your stay. Please come and visit us again when you return to Orlando. Nice clean unit, close to attractions, we enjoyed our stay. Thank you for staying with us and taking time to send in a Review. Do come and visit us again should you return to Orlando. The townhouse is exactly as pictured and perfect for our group of 5. It was very close to the convention center and major attractions. Wish there were just a few additional amenities such as additional toiletries in the event of forgetting to bring it (as I did!). The refrigerator had a water dispenser but it was not working, also unfortunate. Overall, great stay for our short trip in Orlando. Our stay was wonderful. We had 3 great bedrooms kitchen and dining area and it was was very comfortable for relaxing. Would stay there again. Thank you for visiting us again this year. We look forward to your return next year. Best wishes for 2018! We really enjoyed our stay in this tastefully decorated, comfortable, immaculate condo. Although we were out and and about a lot, it was a lovely place to come home to. We especially enjoyed the comfortable beds and linens. Management and the owner Sam were accommodating, helpful and easy to work with. Enjoy! Thank you for taking time to send us your Review, and we are so glad you had enjoyed your stay in our townhome. Do come and visit us again when you return to Orlando next time. This was the perfect place for our party of 4. The condo is exactly as advertised - clean, great setup and feels like home! We enjoyed the clubhouse amenities - especially the pool. We would not hesitate to stay here again on our next visit to Orlando. Thank you so much for choosing to stay with us, and for taking time to send us your Review. We are so glad to know you had enjoyed your stay. Do come and visit again when you return to Orlando next.